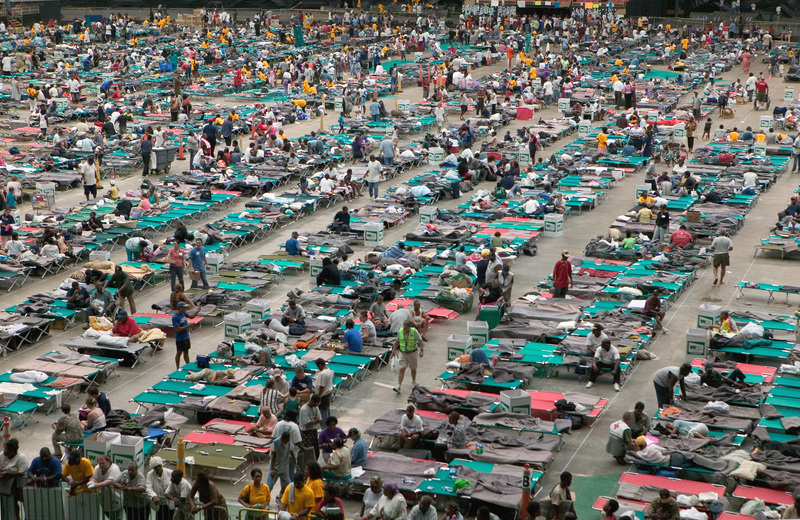 Houston,TX.,9/1/2005–Thousands of hurricane Katrina survivors from New Orleans are bussed to refuge at a Red Cross shelter in the Houston Astrodome. Adventist Community Services is responding to flooding in northwest Louisiana and is in need of 20k – 50k sqft of warehouse space with at least one dock-high door. It prefers the Shreveport area. ACS does not need services, just the space for two+ months, depending on donation volume. St. Vincent de Paul is operating its “House in a Box” program for the December tornadoes in Garland/Rowlett, Texas. It is seeking 10,000 sqft of warehouse with a small office area and at least one dock-high door. Space is needed for approximately one year. MHE continues as a high-priority need. Permanent donations are preferred, but ALAN has had some businesses provide extended no-fee leases. Adventist Community Services is responding to flooding in Louisiana and has requested the loan of a forklift for use in its distribution operations. United Way of Flint – United Way of Flint has provided a consolidated needs list of its agency partners working on water distribution. It has requested 12 pallet jacks and 50 hand dollies. Students at the U.S. Merchant Marine Academy working on a capstone project are looking to interview businesses who provided supplies, equipment, or services in response to the following domestic and international disasters: NYC terrorist attack 9/11/2001, Hurricane Ike 2008, Hurricane Sandy 2012, Haiti Earthquake 2010, Typhoon Haiyan 2013, Humanitarian Crisis Syria and region – present. The students are primarily interested in comparing air and land responses with those by sea. Adventist Community Services is responding to flooding in Louisiana and has requested the loan of a 20’ -26’ box truck with lift gate.